Review: Daniel Maunick and David Brinkworth's second Far Out Monster Disco Orchestra album, Black Sun, was something of a rip-roaring, sun-soaked treat: a wholehearted tribute to Brazilian disco and jazz-funk that wowed us on its release a couple of months back. This 12" sees two of the album's standout moments get the remix treatment. 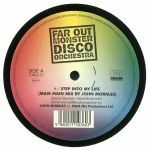 Veteran New York disco-mixer John Morales handles side A, brilliantly extending and rearranging the brilliant "Step Into My Life" with the help of a few dub delays and a healthy dose of reverb. Al Kent goes all Balearic disco on side B, turning in a near 120-minute, pitched-down revision of the gorgeous "Two of Us", before dubbing out the same track in a similarly dreamy fashion. Review: Far Out Monster Disco Orchestra, Daniel Maunick and David Brinkworth's whole-hearted tribute to 1970s Brazilian disco, last showcased its celebratory, sun-kissed wares way back in 2014 via an eponymous debut album that's still capable of setting the pulse racing. 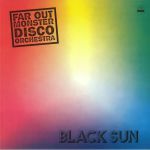 Black Sun, the outfit's second album, contains another superb selection of authentically played and produced disco songs and instrumentals. Check, for example, the blissful jazz guitars and heavy "walking" bass of "The Two of Us", the richly orchestrated and horn-heavy "Step Into My Life" and the spine-tingling, piano-fired breeziness of "Flying High", whose seductive female vocals are smothered in just the right amount of reverb. Review: Far Out Monster Disco Orchestra are in safe hands right here as serial editor and connoisseur Al Kent takes the parts of one of their 2014 album highlights "Vendetta" and revisions them into a hypnotic dancefloor trip. Where the original is loose and prone to steamy Latin string histrionics, Al's edits restrain the emotion a little and let it leaks out much more gradually over an enticing weave of percussion. Whether it's the vocal or dub version, both are guaranteed to take your floor to new places. Review: The past six years have seen Far Out call on the great and the good to rework material by the Dave Brinkworth and Daniel Maunick-led ensemble, Far Out Monster Disco Orchestra with John Morales, Mark E, Theo Parrish, Marcellus Pittman, Dego and DJ Spinna among the contributors. La Vida man Andres is pulling ahead of the competition in terms of appearances on the series, having contributed two remixes in the space of a year. He's back for a third time with an alternate mix to "Where Do We Go From Here" alongside LTJ Experience man Luca Trevisi. Whilst the Andres mix of the track that featured on a 12" earlier this year was an exercise in chopped simplicity, there is a touch more complexity to this alternate take which shows off his ear for warming musicality. The LTJ take is super deep and super good!